How does Testuff integrate with FogBugz? Although Testuff is a hosted service it can automatically send every reported defect to your FogBugz account. 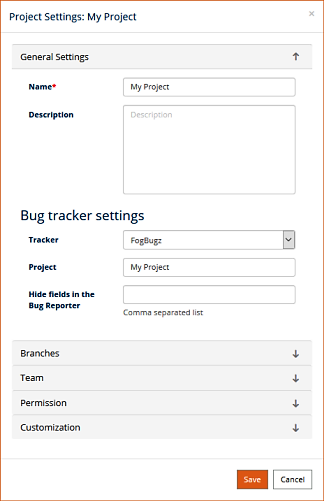 You can run your manual tests with Testuff and continue to use FogBugz for bug tracking. If you host FogBugz on an internal server, the integration is done likewise. Our server doesn’t need to access your bug tracker server and you don’t need to change anything in your security or firewall configuration to make it work. How do I configure FogBugz with Testuff? Choose FogBugz from the Select a bug tracker combo box. Fill in the FogBugz server address in the URL field. This should be the FogBugz URL, omitting any file names that may appear after the last slash. Set the default Project. Defects exported from Testuff projects that do not have a custom FogBugz project will be exported using this project name. You may click the Submit a sample defect report link to make sure Testuff can create bug reports in FogBugz. If all goes well the new bug report should be displayed. Click the SAVE button to register the new settings. The best and easiest way is to click on the Customize bug tracker fields button and use the Show available custom fields link, then select those you wish to add. Can I associate a custom FogBugz project to a Testuff project? Yep. If you wish to export defects from a certain Testuff project to a certain FogBugz project, follow the instructions below. Projects that do not have a custom FogBugz project set to them will use the default one from the general settings. Under General Settings section, make sure the Tracker field is set for FogBugz and fill in the Project for this Testuff project. Please contact us for any help integrating Testuff with your FogBugz.